This intelligent, well-sourced critique focuses on the economics of the meat industrial complex. This top-to-bottom critique details how the government works with the meat industry to nearly force Americans to eat excessive amounts of animal-based foods. 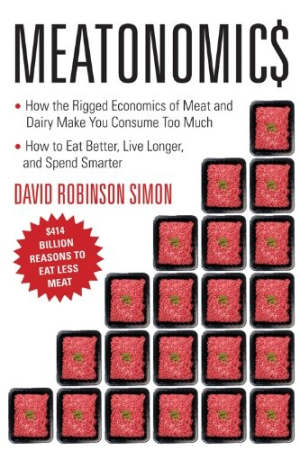 Meatonomics, by David Robinson Simon, examines the forces that encourage people to eat too much meat (like government subsidies for farmers) and equips readers with the knowledge needed to pursue a healthy, life-lengthening diet—and save money. The goal of healthy living and cost savings is nearly universally appealing. Simon cites numerous studies that link overconsumption of animal-based foods to obesity, cancer, and diabetes. The book is divided into two parts: “Influencing the Consumer” and the “Hidden Cost of Meatonomics.” The first examines the laws and marketing that drive consumer demand for animal-based foods. The second shows the far-reaching impacts on health and the economy of eating too much meat. The economic aspect makes this book unique. Many books attack meat consumption, but few do it from a monetary angle. Simon doesn’t hesitate to take lawmakers and marketers to task for damaging people’s health and the nation’s economy. His boldness falls in line with the overall voice of the activists who are wary of meat consumption and government control of industries. Each sentence, paragraph, and chapter heaps evidence upon evidence to support his arguments. Simon’s writing style is intelligent and well sourced without being academic and dry. The research and clear thought shows his expertise and easily wins readers’ trust. Readers who aren’t willing to make potentially radical changes to their thinking, eating, and spending habits won’t reap the full benefits of Simon’s approach. To skeptics, his endless stream of reasons may feel almost like they’re hiding something because Simon leaves no room for contrary thought. This book will appeal to those who were motivated, convicted, or validated by films like Food, Inc. and Forks Over Knives—independent thinkers who are willing and driven to pursue health and non-government-mandated lifestyles at all costs. The endnotes are comprehensive (more than fifty pages) and well annotated to facilitate deeper understanding. Appendix A, “Animal Foods and Human Health,” goes beyond meat to show the dangers of dairy, eggs, and seafood. Another appendix tallies the health, environmental, and other costs of US animal food production. The final two appendices look at proposed tax changes that will affect factory farming practices and the quality of meat produced.